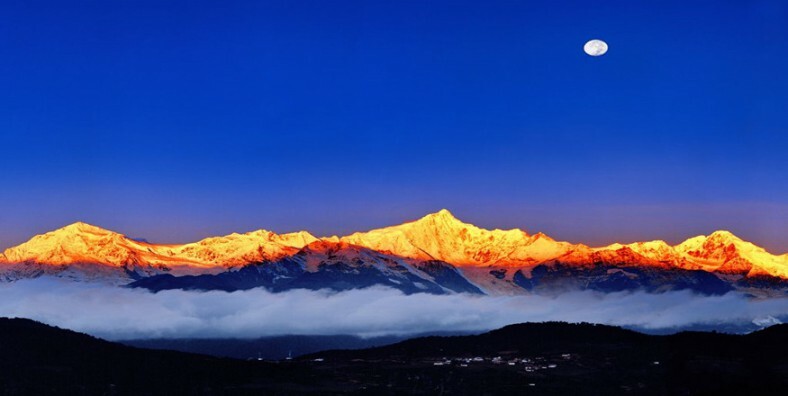 Meili Snow Mountain is a mountain range in the Chinese province of Yunnan. It lies close to the northwestern boundary of the province and is bounded by the Salween River on the west and the Mekong on the east. During this tour, we will start from Lijiang and then transfer to Deqin via Shangri-La to experience the Pilgrimage trekking. Visit the highlights of Lijiang and Shangri-La. 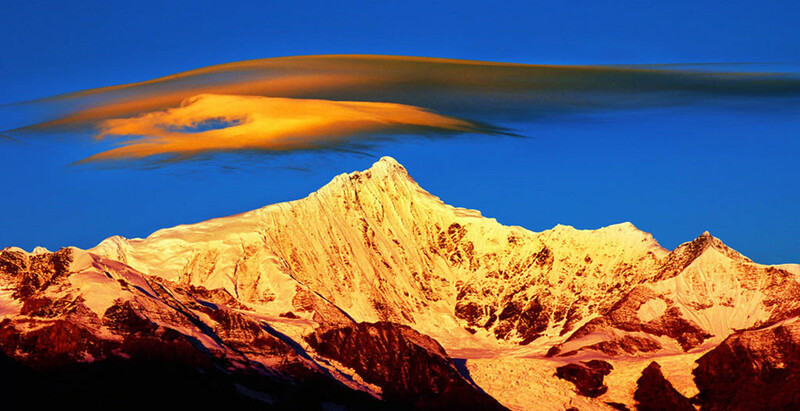 Experience Meili Snow Mountain Pilgrimage trekking. Our Lijiang tour will start with Ancient town of Lijiang, a world heritage site. Then move on walking upstream along the Yuhe River to Black Dragon Pool to enjoy the reflection view of the Jade Dragon Snow Mountain. After that, head to Dongba Ethnic Museum to explore the culture of Naxi ethnic people. The last stop is Baisha Old Town. From Lijiang, drive about 60KM to visit the First Bend on the Yangtze River with imposing gorge scenery and the Iron Chain Bridge in the Stone Drum(Shigu) town. The town of Stone Drum got its name from a large, cylindrical, marble tablet shaped like a drum. Further driving 40KM to visit the Tiger Leaping Gorge, the deepest gorge in the world. With 34 rapids of the Yangtze River, it is called the Jinsha in this area because we can find gold in the river. Afternoon, head for Shangri La, the former Zhongdian. Shangri-La is the Tibetan cultural area and has a landscape of barley fields and yaks scattered in the valleys. In the morning, visit the Ganden Sumtseling Monastery, the largest Tibetan monastery in Yunnan. Then drive to Deqing. Enjoy the stunning scenery along the way such as Yangtze river bed, classic Tibetan villages, the rugged Baima snow mountain. Stop at Dhonchuling monastery, the second biggest one in the Yunnan-Tibetan area. Then go to a cozy Tibetan nunnery. Overnight at Holy Mountain Hotel in Feilaisi. Drive to the south and into Mekong River valley with a view of Kawa Karpo if the weather is fine, and a bird-eye view of winding Mekong below with tiny “castle-like” Tibetan villages nearby. After 2.5-hour’s drive, arrive the trekking start point where we’ll meet our horses with their cheerful owners. Trekking equipment and food will be loaded on the horses. Then have a short stretch over Mekong to a small temple, which is regarded by Tibetans as “the key “or “the permit” to the pilgrimage (Kora). Here we’ll put up our tents in the courtyard of the cozy temple. Alternatively, just set up our tents on the roof-top of Tibetan houses after 2-hour walking more. Today we will trek 7 hrs to the campsite (2800m). Load our ponies and say good-bye to the Mekong River valley. Be ready to have a long climb towards Dokla pass (a mountain ridge of Kawa Karpo between Mekong- and Salween River). Walk together with dozens of ponies along a winding trail, accompanied by the great sounds of our pony’s bells which gives you a feeling of being in a caravan. The trail leads us up through scattered villages on the slope, steep cliffs and old-growth forest overlooking the breathtaking Mekong river valley. Frequently, we will encounter different species of Rhododendron, orchids and some other unknown-name wild flowers. Have picnic lunch with hot tea and instant coffee, plus a spectacular view. We will encamp on the relatively flat slope by a running stream. The campfire will accompany us through the night. Today trek 5 hrs to the camp meadow (3450m). Follow the footprints of Tibetan pilgrims. We will frequently encounter some holy places such as “Holy Caves”, where pilgrims crawl through for some certain reason and is surrounded by piled good-wish stones, old jewelry and clothing from pilgrims, prayer flags……so mysterious! At that moment, if you want to speak to someone just whisper to each other to pay your respect. Have picnic lunch by a running stream. Afterwards, the pilgrimage path brings us to a great meadow named Yongshiton, with a murmuring stream flowing through it and surrounded by Rocky Mountains. There are some shepherd’s sheds as shelters for pilgrims as well as for herds of yaks and horses. Here is our campsite tonight. Today is a tough day for 9 hours trekking, which is a sort of challenge with a good deal of excitement. Morning leave our charming campsite to ascend up through the old-growth forest and then arrive at the tree-line, where we can see the Dokila pass (4560m), which we are going to climb over. Have Picnic lunch with hot tea and instant coffee will be served. After a 6-hour-climb, we will be at the top of the pass, up there the land is covered by the piles of prayer flags, bowls, yak skulls…. and the view is great. From here we’ll drop down along a zigzag “holy path” with pilgrims to another meadow (3670m) for camping just inside the TAR (Tibetan Autonomous Region). Trek 7 hrs today. Follow a crystal-clear river into a long valley covered by immense forest. If lucky enough, we will encounter some wild animals. After 5-hours’ trekking, we come to a shrine for pilgrims, where they left offerings of clothes, bowls, tsamba, money and so on for their next lives. They believe that they will retrace back along this path after being reborn. Picnic lunch with hot tea and instant coffee will be served. From the shrine we will descend down to the campsite (2550m), located by a tributary of Salween river on the other side of Mt Kawa Karpo. Trek 9 hrs today. The pilgrimage path zigzags up through the untouched dense forest of fir, spruce, oak and pine trees with the beautiful “hanging” moss. After a 6-hour-climbing, we reach another pass (3820m) with a shrine, where there is a mass of offering of prayer flags, clothes, jewelry and so on. This is a good viewpoint for Salween River valley, Gaoligong mountain range and a Tibetan village named Aben in a deep valley down below. Then downhill to Aben village, where we can sleep on the roof top of Tibetan family, and first chance in the trek: beers, sprite, pepsi are available here as a big luxury. This is also a good chance for our ponymen to have a nice relaxed night with local people. Trek 5 hrs today. Descend down to meet Salween River, en route enjoy some fascinating stone carvings of Tibetan words and Buddhist images on the cliff, where is revered by Tibetan pilgrims as a shrine. But it is also a pity to see that some of the Buddhist carvings ruined during the Cultural Revolution. Afterwards, we walk along a dirt road to our campsite (1950m) by Salween amongst the woods of cactus. Trek 4 hrs today. We carry on by the Salween northward, so arid here but still some Tibetan hamlets scattered on the steep slopes of either side of the Salween. Eventually we come to a comparatively densely populated tiny town (Chawalong) with an old tiny temple. Camp overnight here. Trek about 4hrs today. Following the mysterious Kora path which leads us to climb up through some charming Tibetan villages with some interesting tiny temples. We could have a fabulous chance to visit local families with hospitable hosts. Yak butter tea is the priority drink offered to guests here. Eventually, the Kora path takes us to the campsite (2840m) near a cozy nunnery on the slope. Here you could have a nice relaxed afternoon free just saving enough energy for the next-day’s long climbing. Trek 8 hrs today. The Kora path is winding its way to climb up to a pass (3350m), with mysterious prayer flags and breathtaking birds-eye views of the Salween River below. Our shepherds will offer a cup of hot tea or coffee here – you will feel that you are at the top of the world at that moment. Afterwards, the path descends down through fir-tree forest and comes to a “holy spring” for picnic lunch. From here the path have come into being a sandy winding one on the mountain sides, while below there is a snake-like tributary (Weiqu) of Salween with some fascinating Tibetan villages on the river banks. Then just cross Weiqu River by a typical Titetan-style bridge to a delightful village (2380m) dwelling on the arid mountain side. Here we set up our tents on the roof tops of the huge Tibetan houses. Trek about 7hrs. Today is a big ascent of nearly 1400m, we zigzag up along the Kora path heading for the pass of Gebu la(4180m), constantly being accompanied by the great views of the arid Weiqu river vally and rocky peaks on the opposite side of Salween. Then, enter a forest and keep walking through till the campsite (3960m), perched on the steep slope of Gebula pass dominated by some big snow-capped peaks from afar and spectacular river gorges down below. I guess it is the most difficulty day for our ponies with so much camp stuff on their backs. Trek 7 hrs. From our campsite we have only a home-stretch distance to climb up, to Gebula pass (4180m), where there is another shrine for pilgrims. Here our pony men always hang their new prayer flags on the trees as a sort of offering for a good wish. Afterwards, we descend along a winding path through an immense forest of fir, spruce, birch, oak, pine trees mixed with bamboo and rhododendron. Then, from time to time, the Kora path is being accompanied by the great views of the snaking Weiqu river blow, and spectacular snow peaks of Mt Kawa Karpo (in fine weather). Eventually, we cross Weiqu River again and ascend up to our campsite (3210m) by a tiny Tibetan village. Trek about 9hrs. The Kora path leads up steeply through the oak woods with beautiful “hanging moss”. After a 3-hour-climb, the path here is getting more gentle through the shrubs and being accompanied by the peaks of Kawa Karpo to the south. From here the path is continuing to be heading for the highest pass(4810m) of Shola, the pass is revered by Tibetan pilgrims as a shrine, where is piled by an enormous mass of prayer flags, pilgrims walking sticks and clothes….meanwhile Shola range is the watershed between Salween and Mekong River, as well as the frontier of Yunnan and TAR (Tibetan Autonomous Region). From here we are leaving Tibetan territory and steps into The Mekong valley of Yunnan until the campsite (4130m). Trek 5 hrs, and drive 4 hrs today it is the final stretch of a 300-KM-long path of the Kora, a long descending path along a stunning valley with a crystal-clear river of Meilishui, en route the various pilgrimage sites in the immense forest and many wild flowers. Eventually, Meilishui River takes us to meet Mekong again, where we’ll reach the finishing point of the Kora. Tibetan pilgrims think what we have done could result in considerable merit. What do you think? A good job! From here we drive back to Deqing town for having a “great shower” which we have been missing for more than two weeks.